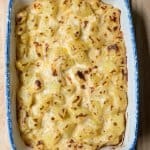 This method for cooking Au Gratin Potatoes is the one I turn to most when entertaining. With a little advance prep, these potatoes will need less time in the oven before your meal. 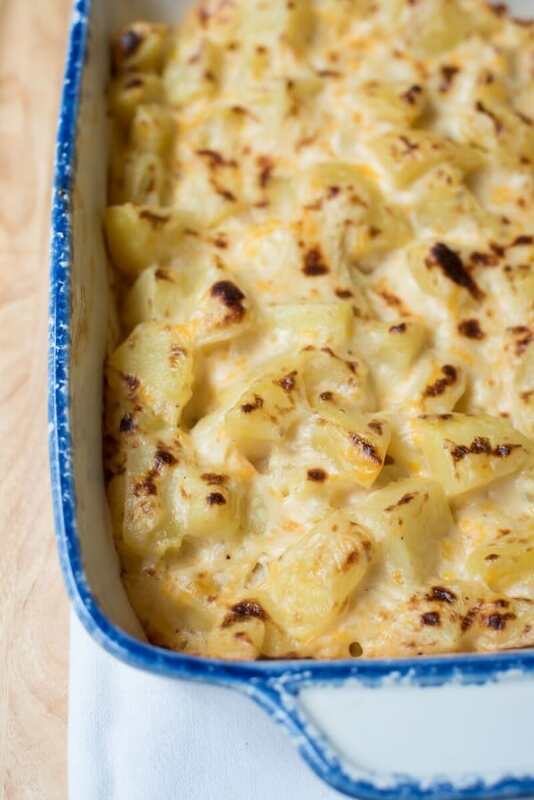 Au Gratin Potatoes are easily one of my favorite dishes to serve with a holiday meal. The only drawback is the long amount of time they need in the oven. If you cook the potatoes from their raw state they need about one and half hours (or more) of oven time. That’s a lot of time hogging the oven when you’ve got a big meal planned for your gathering. 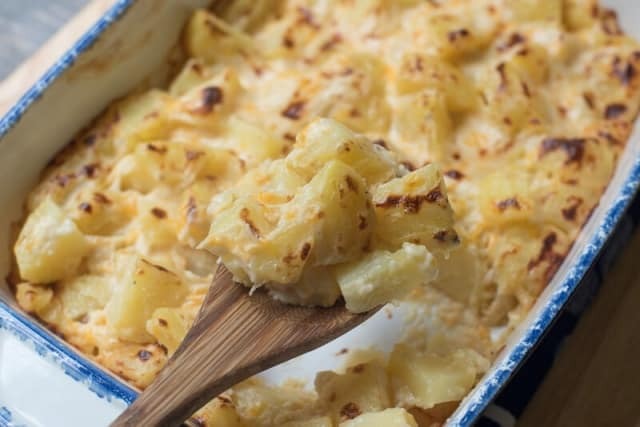 With this method, the potatoes are baked in advance which means less time in the oven, which means delicious, cheesy potatoes on your table with less waiting. This is A-okay with me. These potatoes are just the thing to go with your Easter ham. 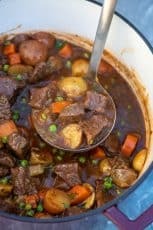 If you’ve got a large group coming, double it and bake them in a good sized casserole dish. 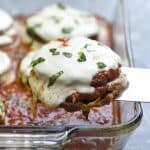 Leftovers are always welcome and reheat beautifully. 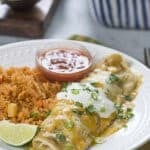 Like most of my other potato recipes, I prefer using Yukon Golds for their naturally creamy, buttery taste. Peel 3 pounds (about 6 medium) Yukon Gold potatoes and place them in a baking dish. 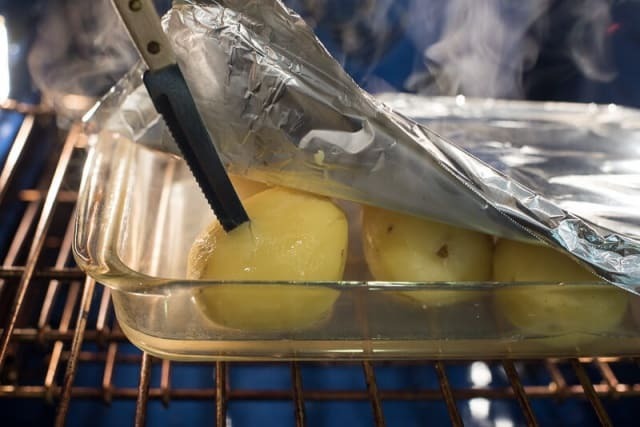 Add 1″ of water, cover the dish with foil and pop it in a preheated 400 degree oven for about 40 minutes. 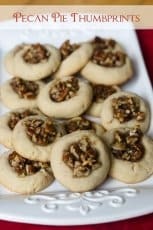 You don’t want to bake them until they are falling apart, just until you can pierce through to the center with a sharp knife without resistance. Transfer the cooked potatoes to a cutting board and let them hang out until cool enough to handle. 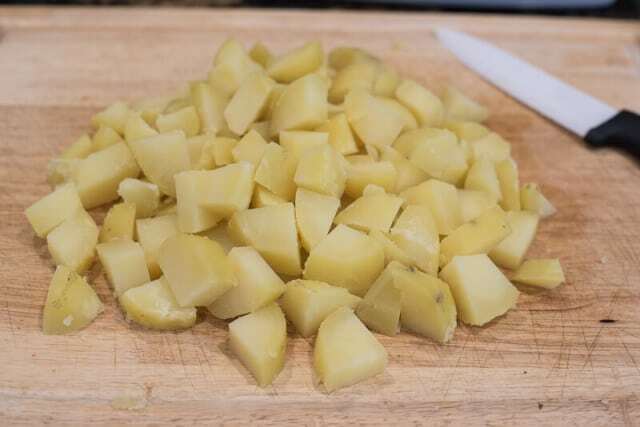 Slice the potatoes about 1″ thick and then cut each round into quarters. I started cutting them this way after having au gratin potatoes from a restaurant that does them this way. It’s a chunkier texture and I like it… a lot. If you’d like to get this step out of the way the previous day – do it! 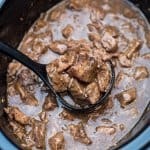 Just be sure to pull the potatoes out of the fridge the next day and allow them to sit awhile to take the chill off before proceeding with the recipe. I’m working in my dark kitchen with my very well used (and loved) Le Creuset French Oven. Feeling rustic. 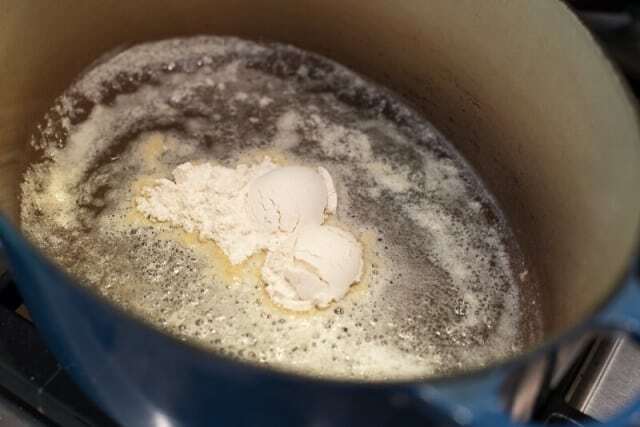 Melt 3 tablespoons butter over low heat and add 3 tablespoons flour. The beginnings of a basic bechamel. 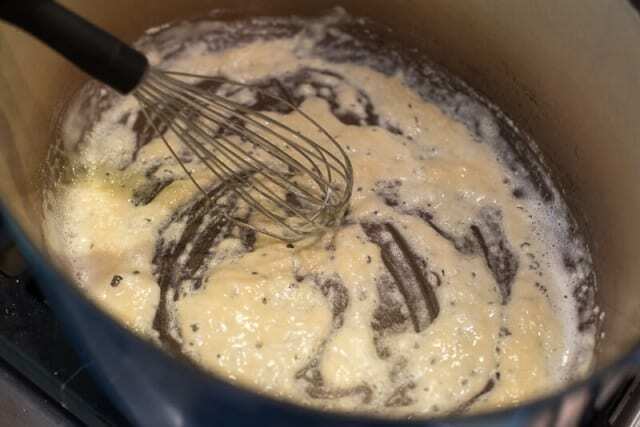 As soon as the flour hits the fat, whisk away and continue whisking for several minutes, being careful that the butter/flour mixture (aka, the roux) does not brown. Add 2 cups of warmed milk, a little at a time, whisking out the lumps as you go. It will appear to be quite thin once all the milk is added but keep it on the heat for awhile and the magic will happen. Continue to whisk until it thickens – this will take a couple of minutes. When it has thickened nicely it is time to pull the pot off the heat. Add 1 teaspoon salt, 1/4 teaspoon onion powder, and some fresh ground black pepper. And, of course, the cheese. 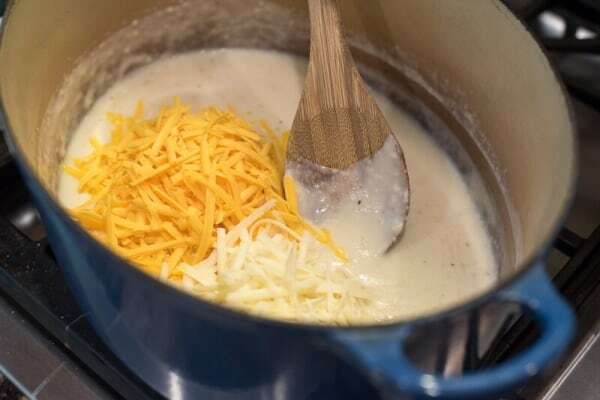 It’s not Au Gratin Potatoes without the cheese – 1 cup of shredded sharp cheddar and 1/2 cup shredded Monterey Jack. You could switch things up here with some different flavors – Swiss, smoked gouda? Hello! 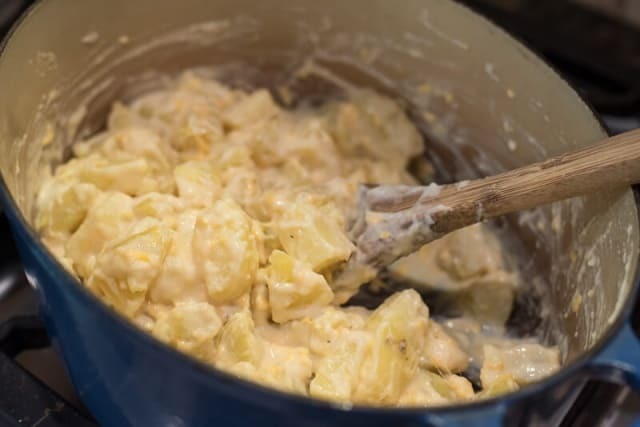 Toss the potatoes right into the pot and stir it into the cheese sauce. 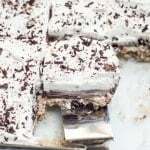 Transfer the mixture to a baking dish that has been coated with non-stick cooking spray, cover it with foil, and pop it in a preheated 375 degree oven for about 40 minutes, or until hot and bubbly. I like to remove the foil at the end of the baking time and let them sit under the broiler for a minute or two to brown them up a bit. Alternately, you can remove the foil for the last 15 minutes of baking time for a more subtle browning. Peel potatoes and place in a baking dish large enough to hold them. Add about 1" of water and cover the dish with foil. Bake potatoes for 40 minutes, or until tender through to center when pierced with a sharp knife. They should be tender enough to slice but not falling-apart tender. Remove from oven and use a slotted spoon to transfer potatoes to a cutting board. 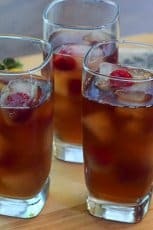 Allow to cool for 20 minutes or until cool enough to handle. Slice potatoes into 1" thick rounds and then quarter the rounds. Sprinkle with a little salt, to taste. 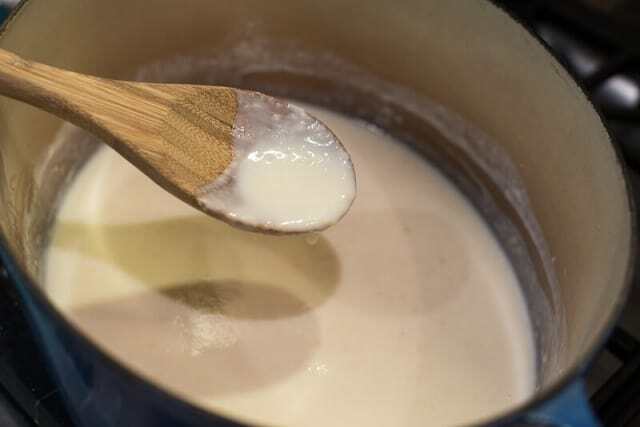 To make the bechamel, add butter to a Dutch oven and place over LOW heat. Allow butter to melt, being careful it does not brown. Add flour and cook, whisking, for about 3 to 4 minutes. 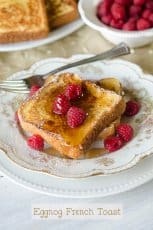 Gradually whisk in the warm milk, a little at a time, whisking as you add it to smooth out the lumps. 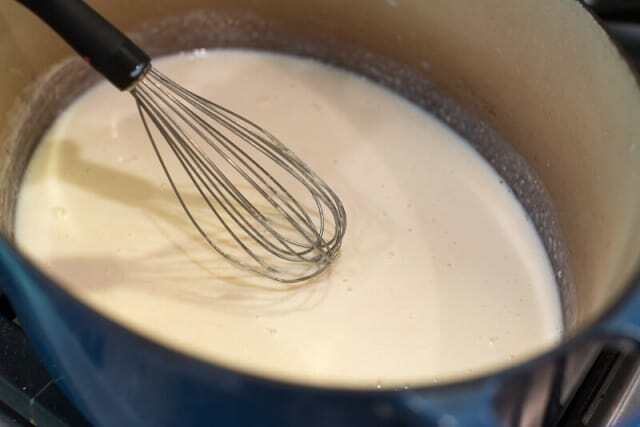 Continue whisking until completely smooth and nicely thickened. Remove from heat. Stir the salt and onion powder into the bechamel. Add cheese and stir until melted. 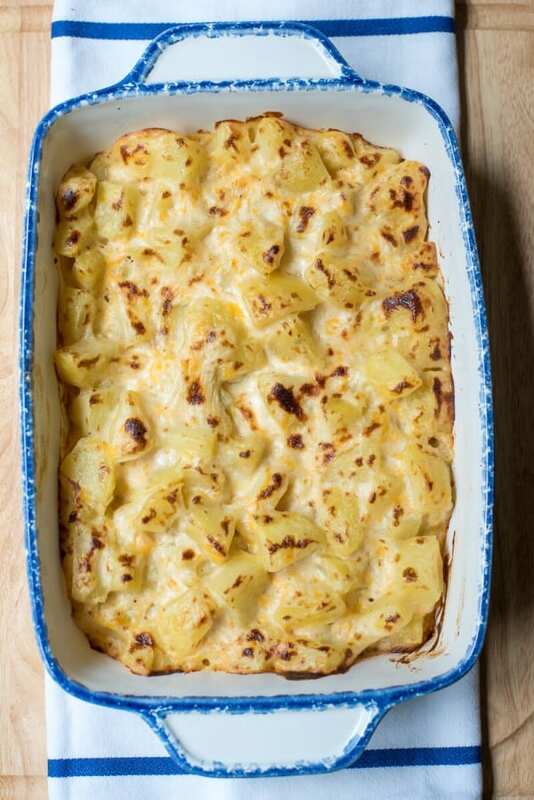 Fold potatoes into cheesy bechamel and mix until potatoes are coated well with the sauce. Transfer mixture to prepared baking dish that has been coated with non-stick cooking spray, cover with foil, and bake at 375 degrees for 40 minutes, or until hot and bubbly. 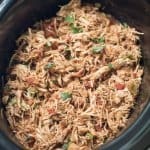 Remove foil, set oven to BROIL, and cook for an additional 2 or 3 minutes, or until top is nicely browned. Alternately, remove foil during last 15 minutes of baking time for a more subtle browning. Make-Ahead Tip: Bake the potatoes a day in advance. Refrigerate overnight and when ready to prepare, remove potatoes from the refrigerator and allow to sit out for a bit to take the chill off and then proceed as directed. If potatoes are chilled when mixing with bechamel, allow for additional baking time. Instead of baking the potatoes to soften them, you can boil them if you prefer. Place in a large pot covered with water, bring to a boil, then reduce heat and cover pot. Simmer for about 25 to 30 minutes, or until tender through to center when pierced with a sharp knife. Watch closely and be careful not to cook too long or potatoes will begin to fall apart. Prep time includes time to pre-bake potatoes. Oh Valerie, these potatoes look AMAZING! 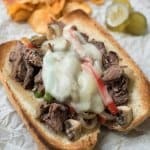 I could eat this as my meal! Hope you and your family have a great Easter! I totally get that, Amy! I think potatoes are the best part of the meal 🙂 Happy Easter to you! 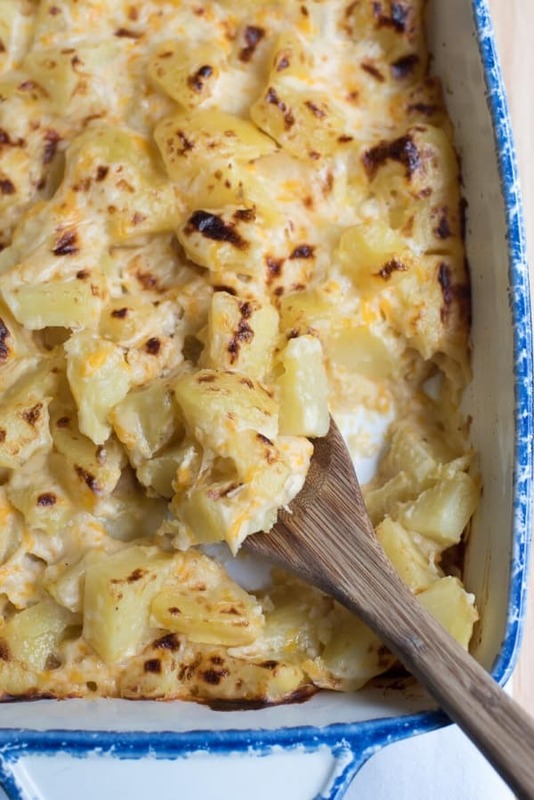 oh cheesy potatoes….I love thee so!